I was just dreaming a little. About my old world. Its strange In the dream, I wondered if everything here, in Aincard, if everything that had happened with you, was only a dream. I was really scared. Im happy this wasnt a dream. Hey, Kirito... If the game is cleared and this world ends, what will happen to her? 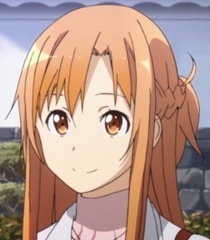 Hey, Kirito... Wanna friend me? (Embarrassed) i-I'm not being rude... You're just an air-head who wants a piece of my Kirito.